We are delighted to be working with experienced artist Vicky Holborough as we once again immerse a whole school in the visual arts for a week. With the focus on drawing – in its widest sense – from making charcoal, to drawing machines, to drawing from life, to book-binding, the pupils will use the New Light Prize Exhibition as the starting point for five days of creativity! At the end of the week, not only will the school have a permanent artwork to display, but all 102 Key Stage Two pupils will have completed Arts Award Discover, the introductory award of this range of unique qualifications that supports anyone aged up to 25 to grow as artists and arts leaders. 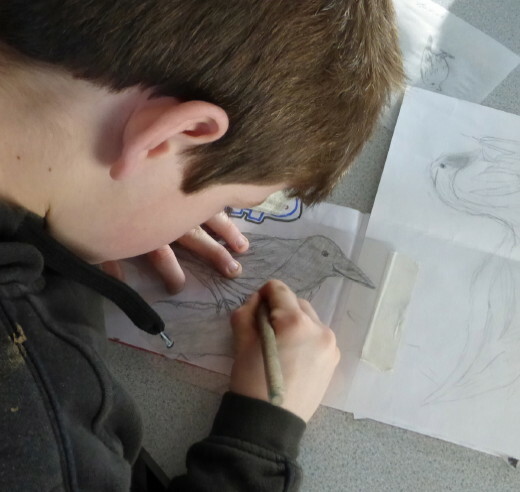 Plus, over 70 Key Stage 1 pupils will have enjoyed a number of exciting art-based sessions.